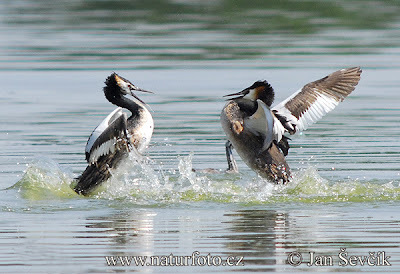 Great crested grebes Podiceps cristatus, photographed by Jan Ševčík. The Podicipedidae contains the grebes and dabchicks, specialised aquatic birds found on freshwater lakes and ponds. Grebes have large feet set well back on the body with lobed toes, tails reduced to a vestigial tuft, and small narrow wings (Heather & Robertson 1996). Grebe nests are floating platforms made from pieces of vegetation and anchored to reeds in shallow water; both sexes participate in the construction of the nest and the rearing of the chicks.